Who’s Your Daddy is a video game that was a joke, then became a Kickstarter, and now it’s a thing. 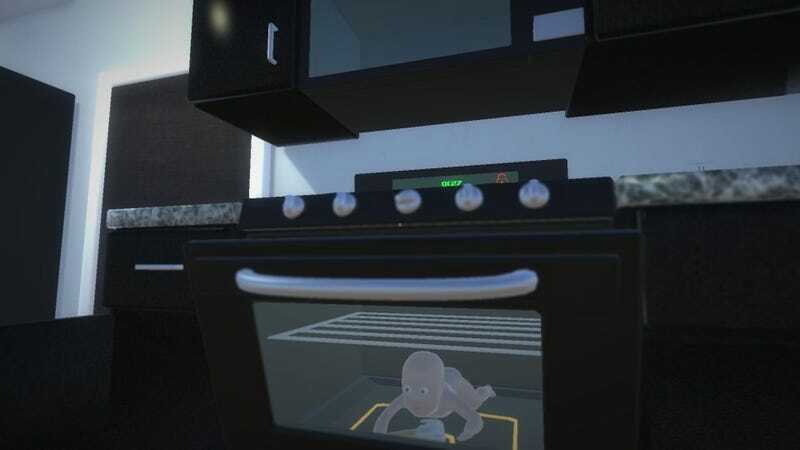 It’s also a game about a baby trying to kill itself. Creator Joe Williams based the idea for the game off a joke post, but in the months since has got serious—or as serious as this game gets, which is not very—about it, with a recent upswing in attention thanks to some prominent YouTubers (like Dunkey, whose clip has over 1.3 million views), who have been playing an alpha build of the game that was made via a successful Kickstarter campaign. This in turn led to an appearance on Steam, and on December 12 Who’s Your Daddy was successfully Greenlit. You can download the alpha and play it yourself here. The game is pretty simple. One player controls the dad, who has to run around the house trying to keep dangerous stuff out of the hands of a baby. The other player controls the baby, who...has to try and kill himself. Drinking poison, climbing into the oven, sticking a fork into a powerpoint, it doesn’t matter how he does it, so long as he does it. If you want to try it out, bear in mind that it’s a little rough at the moment. Multiplayer connections are also a little shaky given the game’s surging popularity (it’s easier to create your own game than try to join someone else’s). A more complete version of Who’s Your Daddy is planned for release on Steam in 2016.